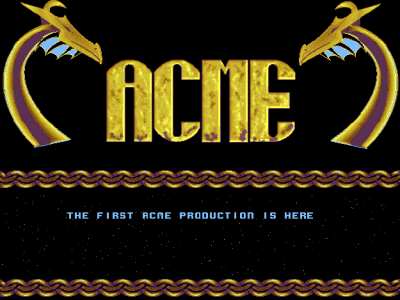 this is the first demo from acme. it shows a starscroll, a scroll and a dragon-logo. very hard to get it running nowadays. Not a bad first attempt by ACME. Standard Brain Slayer style 3 level horizontal star scroller, with fading text overlayed. After the text intro, there is a nice looking 2D plasma effect. This is hires-VGA! Great for 1993! page created in 0.012366 seconds with 15 queries.